Artisan winemaker, Derek Jones from DJ Wines makes his wines in small batches using natural winemaking principles in a boutique winery. Recently Derek has also taken over the management of a small neighbouring vineyard, the grapes from which have created Suffolk’s newest aperitif and dessert wine Bigod 110, extending his range of liqueurs produced at the winery. It is all about the fruit and low intervention winemaking, neither manipulating with the process nor adding nasties along the way. Crafted from whole UK fruit, mostly East Anglian to produce fantastic fruit wines which retain their inherent acidity and sweetness, without additives and typically contain very low levels of total sulphites. Though not certified as such, these wines are suitable for vegetarians and vegans. Also regularly host a stand at various county fairs and food &amp; drink events around East Anglia, list of events can be found on the website. This gives you the opportunity to try before you buy! 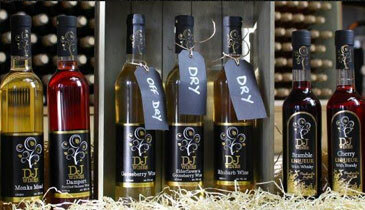 DJ Wines advertise regular 'cellar door' days (please see our website for further details).